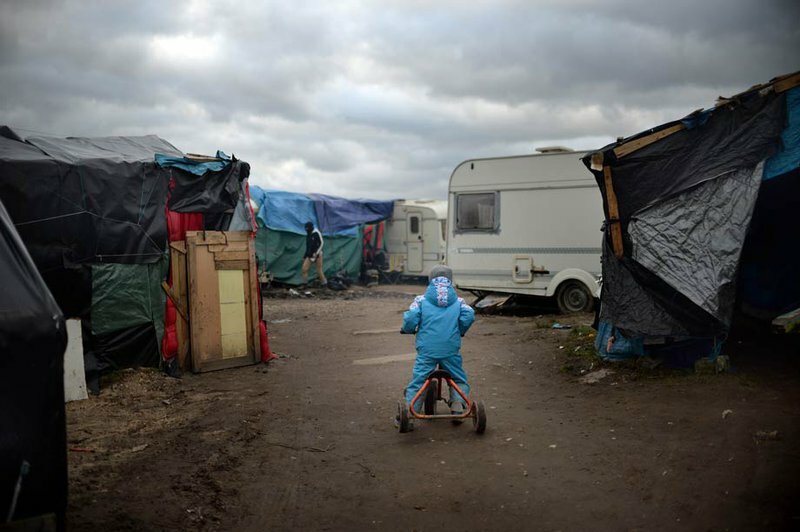 The Jungle refugee camp in Calais, France. Anthony Devlin/Press Association Images, all rights reserved. This summer I am cycling across Europe, following the routes of migration back towards Syria, trying to learn as much as I can about how the current crisis is changing the lives of both residents and refugees. One of the beautiful things about this bike ride is that we can connect places to places and people to people. In Whitstable, Kent, we spoke to Shernaz, an active organiser of support going from that part of the world to migrant camps in Calais and beyond. She told us that we must visit Kate McAllister while in Calais, who works on an educational project there. So two days of cycling later, that’s exactly what we did. Kate usually lives in Brighton with her husband and their three-year-old daughter, a quick blue-eyed blonde called Matilda, who excels at the preparation of tea and pancakes. In these precious pre-school years, Kate saw an opportunity to up sticks and move the family across to France. Now Kate sits in the Darfuri compound of the Calais camp, surrounded by sunshine and numbered tents. Beside us is parked the eponymous School Bus, a red minivan that seems to give Kate a free pass with the police who guard the camp entrances. At our backs is the new school building. I was last here in July 2015, teaching in the school that preceded this one. It was a low ceilinged dark box, coated in sheet plastic like so many buildings here. It was torched and burnt to the ground the night after a camp fight between Sudanese and Afghans. Its successor is a bright wooden structure, built by Kate’s Portuguese carpenter husband, complete with windows and painted with glorious technicolour flowers and chickens. There is a kitchen and herb garden beneath the front windows, good for teaching the names of lettuce, mint, and strawberries rising from the ashes. The Sudanese who live here are in transition, many buried in the process of applying for asylum in France, waiting to find out where they will be transferred, and what kind of a life can resume. Not many of my former students remain from 10 months ago, but Kate tells me of one who has found a flat in Calais, but still returns to visit the camp often. “It is not enough that you are alive”, Kate says, “these people are looking for a life”. I watch Matilda plopping sand castles out of a bucket, soaking up with her pre-school brain the new normality of her sand pit education. It’s a long way from Brighton – but only metaphorically. Kate talks about when she will have to leave Calais, in July. “I can get on a train to Ashford, be here in two hours”, she says, “and still teach a full day in the school”. Commuting to Calais: easier than we might think. Kate talks passionately about the small things that keep communities apart, and about how those gaps can be closed with the mildest effort, like a two hour commute – or a well-stocked backpack. Closing those gaps is the aim of The School Bus Project. The School Bus Project is a teaching initiative founded by Kate and a small team of education and refugee support professionals. After several iterations, the project needs only one week to build and start a school: from nought to taught in seven days (a catchphrase I’m pretty sure they won’t adopt…). Hear Kate McAllister speak about The School Bus Project. On their first day, the teachers go into a community and offer to make pancakes together. Pancakes are an international food: but only crazy westerners put lemon and sugar on theirs. It’s an instant connection. The next day, the teachers come back and offer to cook a full meal together with the community. The communal cooking is an opportunity to learn English, share stories, and build trust. After three days of this, a bond has formed and the school can begin in earnest. The idea is that the model is highly flexible, highly mobile, and easily shared. Teachers should be able to seed new teaching communities by the time they have finished their service in Calais. But the virtuous circle does not only breed English teachers. Kate believes the larger share of her work is now in the UK, connecting existing communities with incoming communities of migrants. The work is the same as here in Calais: bring people together, learn how to cook each other’s food, share a meal, and along the way, pick up smatterings of a stranger’s language and culture. Kate ran a first trial in Brighton. Syrian refugees, who had been stranded in Dunkirk only a few months before, shared their recipes with locals, and the two communities cooked and ate together. Nourishment for stomach and soul. Making Sudanese Halla (beef stew) – The School Bus Project, Calais. After a career spent in the corridors of state schools in the UK, Kate took some time adjusting to the lawlessness of Calais. It gave her the confidence to step out and try her ideas. She originally came here to assist whoever was on the ground, running educational projects. But there was no one to help, so she had to do it herself. Kate knows she is not like everyone else, that not everyone will close gaps quite as wide as that. But Kate shows that even the widest gaps can be closed, and she has convinced me that perhaps our first step is making pancakes together. Make mine goat’s cheese and honey. Follow David's journey through his mailing list or on his blog. David is also raising money for The Bike Project in London, which they take second hand bikes, fix them up, and donate them to refugees. Please consider a donation!